This article is about the superstition. For the horror film franchise, see Friday the 13th (franchise). For other uses, see Friday the 13th (disambiguation). Friday the 13th is considered an unlucky day in Western superstition. It occurs when the 13th day of the month in the Gregorian calendar falls on a Friday, which happens at least once every year but can occur up to three times in the same year,for example in 2015, on 13 February, 13 March and 13 November. In 2017, it occurred twice, on 13 January and 13 October. In 2018, it also occurred twice, on 13 April and 13 July. There will be two Friday the 13ths every year until 2020; 2021 and 2022 will have just one occurrence each. A Friday the 13th occurs during any month that begins on a Sunday. The fear of the number 13 has been given a scientific name: "triskaidekaphobia"; and on analogy to this the fear of Friday the 13th is called paraskevidekatriaphobia, from the Greek words Paraskeví (Παρασκευή, meaning "Friday"), and dekatreís (δεκατρείς, meaning "thirteen"). It is possible that the publication in 1907 of Thomas W. Lawson's popular novel Friday, the Thirteenth, contributed to disseminating the superstition. In the novel, an unscrupulous broker takes advantage of the superstition to create a Wall Street panic on a Friday the 13th. A suggested origin of the superstition—Friday, 13 October 1307, the date Philip IV of France arrested hundreds of the Knights Templar—may not have been formulated until the 20th century. It is mentioned in the 1955 Maurice Druon historical novel The Iron King (Le Roi de fer), John J. Robinson's 1989 work Born in Blood: The Lost Secrets of Freemasonry, Dan Brown's 2003 novel The Da Vinci Code and Steve Berry's The Templar Legacy (2006). Tuesday the 13th occurs in a month that begins on a Thursday. In Italian popular culture, Friday the 17th (and not the 13th) is considered a day of bad luck. The origin of this belief could be traced in the writing of number 17, in Roman numerals: XVII. By shuffling the digits of the number one can easily get the word VIXI ("I have lived", implying death in the present), an omen of bad luck. In fact, in Italy, 13 is generally considered a lucky number. However, due to Americanization, young people consider Friday the 13th unlucky as well. The 2000 parody film Shriek If You Know What I Did Last Friday the Thirteenth was released in Italy with the title Shriek – Hai impegni per venerdì 17? ("Shriek – Do You Have Something to Do on Friday the 17th?"). Friday the 17th occurs on a month starting on Wednesday. According to the Stress Management Center and Phobia Institute in Asheville, North Carolina, an estimated 17 to 21 million people in the United States are affected by a fear of this day, making it the most feared day and date in history. Some people are so paralyzed by fear that they avoid their normal routines in doing business, taking flights or even getting out of bed. "It's been estimated that [US]$800 or $900 million is lost in business on this day". Despite this, representatives for both Delta Air Lines and Continental Airlines (the latter now merged into United Airlines) have stated that their airlines do not suffer from any noticeable drop in travel on those Fridays. In Finland, a consortium of governmental and nongovernmental organizations led by the Ministry of Social Affairs and Health promotes the National Accident Day (kansallinen tapaturmapäivä) to raise awareness about automotive safety, which always falls on a Friday the 13th. The event is coordinated by the Finnish Red Cross and has been held since 1995. A study in the British Medical Journal, published in 1993, attracted some attention from popular science-literature, as it concluded that "'the risk of hospital admission as a result of a transport accident may be increased by as much as 52 percent' on the 13th"; however, the authors clearly state that "the numbers of admissions from accidents are too small to allow meaningful analysis". Subsequent studies have disproved any correlation between Friday the 13th and the rate of accidents. On the contrary, the Dutch Centre for Insurance Statistics on 12 June 2008 stated that "fewer accidents and reports of fire and theft occur when the 13th of the month falls on a Friday than on other Fridays, because people are preventatively more careful or just stay home. Statistically speaking, driving is slightly safer on Friday the 13th, at least in the Netherlands; in the last two years, Dutch insurers received reports of an average 7,800 traffic accidents each Friday; but the average figure when the 13th fell on a Friday was just 7,500." In years which begin on the same day of the week and are of the same type (that is, whether they are a common year or leap year), Friday the 13th occurs in the same months. This sequence, given here for 1900–2099, follows a 28-year cycle from 1 March 1900 to 28 February 2100. The months with a Friday the 13th are determined by the Dominical letter (G, F, GF, etc.) of the year. Any month that starts on a Sunday contains a Friday the 13th, and there is at least one Friday the 13th in every calendar year. There can be as many as three Friday the 13ths in a single calendar year; either in February, March and November in a common year starting on Thursday (such as 2009, 2015 or 2026) (D), or January, April and July in a leap year starting on Sunday (such as 1984, 2012 or 2040) (AG). The longest period that occurs without a Friday the 13th is 14 months, either from July to September the following year being a common year starting on Tuesday (F) (e.g. 2001/02, 2012/13 and 2018/19), or from August to October the following year being a leap year starting on Saturday (BA) (e.g. 1999/2000 and 2027/28). The shortest period that occurs with a Friday the 13th is just one month, from February to March in a common year starting on Thursday (D) (e.g. 2009, 2015 and 2026). Each Gregorian 400-year cycle contains 146,097 days (with 97 leap days) or exactly 20,871 weeks. Therefore, each cycle contains the same pattern of days of the week and thus the same pattern of Fridays that are on the 13th. The 13th day of the month is slightly more likely to be a Friday than any other day of the week. On average, there is a Friday the 13th once every 212.35 days, whereas Thursday the 13th occurs only once every 213.59 days. In Finland one F13 is chosen as National Accident Day to raise awareness about automotive safety, this is possible because there is at least one F13 each year. The table is for the Gregorian calendar and Jan/Feb for leap years. ^ a b c d "Months and Years having Friday the 13th". ^ "Months and Years having Friday the 13th". ^ a b Weisstein, Eric W. "Triskaidekaphobia on MathWorld". MathWorld. Retrieved 14 August 2010. ^ DellaContrada, John (9 February 2004). 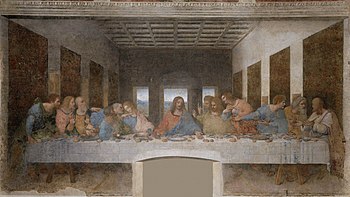 "Fear of "Friday the 13th may likely have originated from Jesus' Last Supper and Crucifixion", Says UB Anthropologist". University at Buffalo, The State University of New York. Retrieved 13 July 2014. There were 13 people at the table (at the Last Supper) and the 13th was Jesus. The Last Supper was on a Thursday, and the next day was Friday, the day of crucifixion. When '13' and Friday come together, it is a double whammy. ^ Hartston, Willam (1 June 2007). Encyclopedia of Useless Information. Sourcebooks, Incorporated. p. 365. ISBN 9781402248382. In Christian tradition, fear of Friday the 13th stems from the day of the Crucifixion (Friday) and the number at the Last Supper (13). Despite these origins, the Friday the 13th superstition dates back only to the Middle Ages. ^ Friday has been considered an unlucky day to undertake journeys or begin new projects at least since the 14th century, as witnessed by Chaucer's Canterbury Tales. ^ a b Nathaniel Lachenmeyer, 13: The Story of the World's Most Popular Superstition ch. 5 (2004). ^ a b Roach, John (12 August 2004). "Friday the 13th Phobia Rooted in Ancient History". National Geographic News. Retrieved 29 October 2008. ^ Clar, Mimi (1957). "Friday the 13th". Western Folklore. 16: 62–63. doi:10.2307/1497075. JSTOR 1497075. ^ Henry Sutherland Edwards, The Life of Rossini, Blackett, 1869, p.340. ^ Thomas W. Lawson (31 August 2005). Thomas W. Lawson, Friday, the Thirteenth (1907). Gutenberg.org. Retrieved 13 May 2011. ^ "Why Friday the 13th Is Unlucky". Urbanlegends.about.com. Retrieved 13 May 2011. ^ a b Chrysopoulos, Philip (13 October 2015). "Why Superstitious Greeks Fear Tuesday the 13th". Greek Reporter. Retrieved 31 October 2016. ^ Carlo Grande (17 February 2012). "Venerdì 17 porta davvero sfortuna?" (in Italian). La Stampa. Retrieved 31 March 2012. ^ Nick Harris (15 November 2007). "Bad omen for Italy as their unlucky number comes up". The Independent. Retrieved 15 February 2015. ^ "Venerdì 13 porta (s)fortuna? Non in Italia" (in Italian). cafebabel.com. Retrieved 31 March 2012. ^ "Venerdì 13 è un giorno che porta sfortuna – Mara rimanda le nozze con Mezzaroma" (in Italian). Corriere del Mezzogiorno. 1 February 2011. Retrieved 31 March 2012. ^ Josh Sens, "Some Don't Count on lucky", Via Magazine, January 2004. ^ "Mikä on Tapaturmapäivä?". www.kotitapaturma.fi (in Finnish). Retrieved 9 January 2018. ^ Scanlon, T. J.; Luben, R. N.; Scanlon, F. L.; Singleton, N. (18 December 1993). "Is Friday the 13th bad for your health?". BMJ. 307 (6919): 1584–1586. doi:10.1136/bmj.307.6919.1584. ISSN 0959-8138. PMC 1697765. PMID 8292946. ^ Melina, Remy (13 January 2012). "Statistically Speaking, Is Friday the 13th Really Unlucky?". Live Science. Retrieved 13 April 2018. For starters, a 1993 study published in the British Medical Journal indicates otherwise. Researchers analyzed the traffic flow and number of injuries from car accidents on the southern section of London's M25 motorway during the five months that the 13th fell on a Friday between 1990 and 1992. They compared these numbers to data collected on Friday the 6th of the same months, and found that although there are consistently fewer vehicles on the road during the 13th — possibly as a result of superstitious people choosing not to drive that day, the researchers proposed — "the risk of hospital admission as a result of a transport accident may be increased by as much as 52 percent" on the 13th. ^ Atul Gawande (20 March 1998). "When a full moon and a lunar eclipse collide with Friday the 13th, do more accidents really happen?". Slate. Retrieved 13 April 2018. The 1993 study, published in the British Medical Journal, compared hospital admissions for traffic accidents on a Friday the 13th with those on a Friday the 6th in a community outside London. Despite a lower highway traffic volume on the 13th than on the 6th, admissions for traffic accident victims increased 52 percent on the 13th. ^ Lo, Bruce M.; Visintainer, Catherine M.; Best, Heidi A.; Beydoun, Hind A. (July 2012). "Answering the myth: use of emergency services on Friday the 13th". The American Journal of Emergency Medicine. 30 (6): 886–889. doi:10.1016/j.ajem.2011.06.008. PMID 21855260. ^ Schuld, Jochen; Slotta, Jan E.; Schuld, Simone; Kollmar, Otto; Schilling, Martin K.; Richter, Sven (1 September 2011). "Popular Belief Meets Surgical Reality: Impact of Lunar Phases, Friday the 13th and Zodiac Signs on Emergency Operations and Intraoperative Blood Loss". World Journal of Surgery. 35 (9): 1945–1949. doi:10.1007/s00268-011-1166-8. ISSN 0364-2313. ^ Mirror.co.uk, "Friday 13th is no longer unlucky". ^ Editorial, Reuters (13 June 2008). "Friday 13th not more unlucky, Dutch study shows". Reuters. ^ Bodin, Magnus (13 November 1998). "About the date+day-distribution along the epoch". x42. Retrieved 30 January 2014. ^ B.H. Brown and Raphael Robinson, "Solution to Problem E36", American Mathematical Monthly, vol. 40, issue 10 (1933), p. 607; Jean Meeus, Mathematical Astronomy Morsels IV, 2007, p. 367. ^ a b c "13 Facts About Friday the 13th". Look up paraskavedekatriaphobia in Wiktionary, the free dictionary.